Oh the many gifts of friends. Laura and Greg, who took us in so graciously for the entire month we had in the US, including a fabulous four days at a perfect cabin on the Hood Canal waterfront (that’s the Olympic Peninsula, for those of you unlucky enough to not know); Soosan and Alvin for taking in both Cam and our Mazda; the Wucos for driving us hither and yon, agreeing to run errands for us after we leave, and painting our house; Tatyana for spending hours on the telephone trying to find a place to store our car for a year; MaryBeth and Steve for helping make the house look like new; and a handful of others for arranging lovely meals, remembering us, following the blog (gasp) and loving us still. It passed in a blur, really, our time in the US. 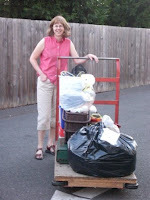 There was so much work to do to clear out our belongings from the house and get it ready for renters, get Cam squared away for New York, Goddard College and India, and deal with banks, license renewals, insurance, property managers, etc. But we started the trip with the Hood Canal escape—a marvelous way to reacquaint ourselves with the natural beauty of the Northwest, and decompress from Beirut city life. 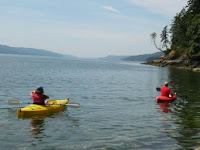 In a kayak at low tide, paddling slowly along the shore, gazing at faded rust colored starfish, brown crabs, a couple of small jellyfish, a young seal popping its head up then floating along. The starfish clumps—a family?-- legs entwined, are different colors, almost brown to coral, and some have different patterns. One’s legs are all bent, as if running or twirling. Later, a strolling hike along the Dosewallips River, pausing to pick tiny wild strawberries—mmmm. Gulping in clear Northwest air, sometimes cedar scented—mmmm again. 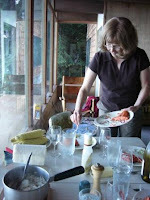 Photo shows Laura serving salmon at the cabin. Sigh. Signs in overprotective, overdirective America: “20 mph between 8 a.m. and 3 p.m. when flashing or when children are present” (can you read all that while driving by? ), and “Watch Your Step”—on top of a bus!! After a couple of weeks, Tom says he is ready for Lebanon traffic, which is unhindered by stops for lights, turns or pulling out into traffic. Even the last day we were dealing with things: two banks, the hedge trimmer, the shower door replacement, the car—all before 11 a.m.
Later, settling in to the long (9 ½ hour) flight to Paris, we rise above the solid cloud layer of Puget Sound, looking like snow in fluffy drifts, heading straight for Rainier. Then we turn left for Canada, and spot the Olympics. And there is Baker sticking its head out. The Airbus plane has a great video/audio set up. Screens at each seat offer 12 new movies and 100 others, all on demand, with pause and rewind, and 200 CDs. T picks Pink Floyd. I try out ones new to me: Katy Perry, then Verve and Duffy. There are 8 or 10 games. Best of all (?) are the cool maps showing flight progress and the camera showing pilot’s eye view of the ground or, presently, the clouds below. You can even watch the landing, which is somewhat unnerving. The map shows Kelowna, Jasper, and Edmonton to the south. The view switches from the “local” area to the region, and to the continental. Hello Abilene, hello Quito. Then to the map in relief from the perspective of where we’ve come, flat plains stretching ahead. And I remember flying here we could see what area of the planet was in darkness. How cool is that? Back to friends. A real gift was being welcomed in people’s homes. 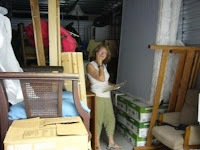 For those of you who organize yourself in piles like I do, and tolerate dust bunnies, Bless You! I get stressed out removing (OK, hiding) my piles of paper and wondering if things are clean enough for normal people before welcoming visitors, It was SO reassuring to see the way Real People in America live. [editor's note; there are NO dust bunnies in Laura and Greg's house] And meals don’t have to be elaborate. A simple meal, shared, is so very nice, so worth it. It doesn’t have to be fancy. Maybe in Lebanon it’s a bit different, with Lebanese anyway—it is expected to have at least four or five dishes to choose from. They have maids and cooks. But I see I shouldn’t hesitate to invite someone in when the apartment is in disarray or the food is ordinary. Another lesson, from teacher lady friends. You (I) can do it. I can try to teach English. Observations of America: people are generally pudgy and lots are fat. People (a significant minority, anyway) wear things with holes, spots or wrinkles. These are all remarkable from the European and 2nd world view, probably 3rd world too. People are busy. What is it that people spend so much time doing? TV I guess, and meetings and house projects, and kids’ activities, and exercise and email—yes, especially email, and meetings, community groups. I enjoyed hearing of the AA meetings some of my friends attend. With total strangers they share pain and experience, courage and hope, in every city across the continent. They go for themselves or for loved ones, trusting strangers to support them in their struggle. Heading toward Hudson Bay. As we near the pole, the sun sets, then rises—no dark! Charles de Gaulle airport is a symphony of remarkable inefficiency and confusion. We would like to run to make our connection to Beirut, but are forced instead to wait for a bus that is late and takes a slow and circuitous route. We make it by moments. Others are not so lucky. Flying along the Lebanese coast I see tankers loaded with oil to run the generators that fuel the air pollution haze. Beirut is a dense sea of light brown high rise buildings, with roads hardly visible—none of the sprawling highways of America. There are few bits of green, a shock after the lush Northwest US. Apartment block life is the norm here, where the word “house” as in “my house” means apartment, and you use the word “villa” to describe an actual house. We are back, 16 hours from Seatac airport. It is hot, and humid. The Rafik Hariri airport is busier than we have ever seen it—arrivals as well as departures, it is important perhaps to note—this is a good sign, a good measure of the health of the country. The next day: oh my gosh—it’s quarter to seven and I’m sweating already.